Have you ever wondered what goes on behind the scenes with a yarn company? I have. 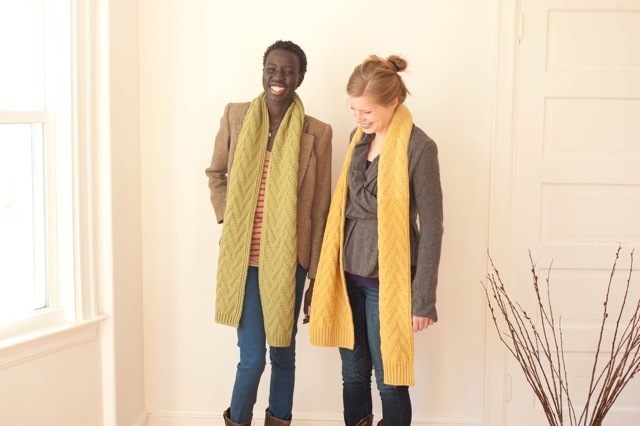 Last fall, I answered Quince & Co’s call for scarf submissions–and to my great joy, the Falmouth Scarf was chosen as one of the pieces for the collection. Not only that, but Pam asked me if I’d be willing to come in and model the scarves, since I’m a mere hour’s drive from their main operation. I’ll be honest: I was excited, but also nervous. The models Quince chooses are all so stunning: there is a depth to them, a soul that you can see in the photographs. I admire Carrie’s work deeply as well as Pam’s spotless aesthetic. Pam had told me minimal makeup–come with a bare face. That surprised me quite a bit! (they want me AS IS?) That’s the thing. They want real people with real flaws and real beauty. When I got there, I was more than surprised. I was greeted at the door by Jerusha, sunny and cheerful (and steaming, and organizing, and visualizing, and tech editing…and…) ushered into a warm room full of sunlight overlooking the Casco Bay Bridge. Mellow music drifted across the minimally decorated space and delicious fruit adorned wooden bowls. Twisted, gnarled willow branches reached forth from vases. The shoot itself was fun. Carrie is very laid back, and we both have 2 daughters similar in age. She kindly laughed at my cheesy jokes. Pam’s sweet dog sauntered around, eyes big, hoping for snacks, and Ryan typed away on a laptop, tweeting the excitement. Here’s another shot of me and one of the other models: and seriously, she is the sweetest thing. It was amazing to get a first look at all the works in this collection. I hope, when you see it, that you will take the time to inspect each one carefully. The stitches, arranged so perfectly with color. The balance of drape and ingenuous construction. And mine: The Falmouth Scarf, loaded with simple yet rich texture in squishy Osprey. Perfect for wrapping around the neck once, even twice, tall enough to block the cold winds easily and sit nicely on the shoulders. Osprey is one of my favorite yarns that Quince produces. It knits up so quickly yet gives satisfaction. It has the richness of hot cocoa with the clean finish of green tea. As most of you following know, I am obsessed with buying local, and Quince is the ideal company for this model. Their wool is 100% US sourced, US spun, US dyed, US shipped. Supporing local at every step of the way. While I’ve heard that they wanted to create a great, basic yarn that would be satisfying to knitters, I have to disagree. This yarn is exceptional, and goes beyond basic in my opinion. The angle of twist on each weight is different- some springy, some smoother. The hand is soft yet strong, and the wool blocks out beautifully. I can guarantee that once you knit with it, you’ll be adding more to your stash. Posted by Alicia & filed under Knitting, Maine. This post has 4 comments. Great work — this scarf is gorgeous. I may have an obsession with texture! Thank you so much! 🙂 One of my favorite stitch patterns!